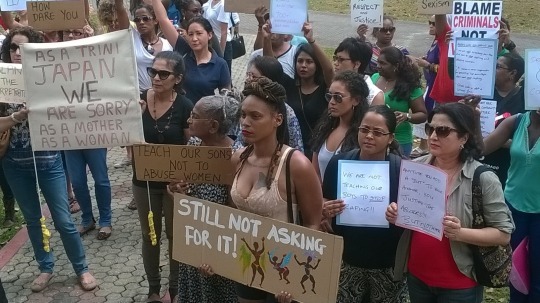 On Friday 12th February 2016, over 100 women and men gathered at Woodford Square to protest the statements made by the Port of Spain Mayor – Raymond Tim Kee – that suggested that women are responsible for protecting themselves against violence by ensuring that their behaviour and dress are not vulgar. He made these statements while discussing the murder of a Japenese woman – Asami Nagakiya – whose body was found clad in a carnival costume in the Queen’s Park Savannah. Many people do not understand why the protest was called, nor see it as a legitimate issue or think it will change anything. I was there and I thought it was extremely successful. Here’s why. 1. There was a clear message, constituency and policy action as the basis. Many people belabour the fact that there have been many murders of women, men and children and that no protests were held. Why this one? Protests are used as a means to highlight an issue that might not otherwise receive widespread attention. This is particularly important when dealing with issues that fall outside the mainstream discourse. The protest organisers clearly articulated the issue – that women should not be blamed for the violence perpetrated against them, regardless of their behaviour and dress. And this message hit a nerve with people in the country. Daily we are bombarded with stories of women who are killed in domestic violence situations, raped, trafficked. It seems that nothing can stem the tide. People understand that the core of this type of violence is a gendered one. One in which women’s autonomy over their bodies is not recognised and where femaleness is devalued and held to unreasonable standards of decorum. The people ‘got it’. As evidenced in the 10, 000 signatures on the Change.org petition circulated by Womantra, people clearly understood and accepted that the messages that the Mayor espoused were wrong, dangerous and unacceptable. Not only did they sign on to the petition but left comments which further iterated that they would not tolerate victim-blaming and attacks to women’s autonomy over their own bodies. 10,000 people were willing to sign their names. When was the last time such a large constituency of persons in Trinidad and Tobago were willing to take a stand on an issue in such a public way? And another 700+ people indicated an interest to support a protest on the issue. Finally 150 braved the Friday traffic and midday sun at Woodford Square in addition to several media and passers-by who even if they did not support the message, heard the message. And there was a clear policy action and strategy attached to the protest. The organisers read the letter that was delivered to the Mayor identifying what they were protesting and what they wanted to happen as a consequence of the protest. So that people participating not only got a chance to express their outrage and pain, they also felt that they were part of an action that could result in a policy change – specifically a change in the way public officials and the whole of the public service respond to issues regarding violence against women and more generally how gender can be mainstreamed into work of all Ministries and public institutions. 2. There was real ‘participation’. Development and distribution of a gender- training toolkit that could be used in all manner of civil society groups, communities, clubs, churches. Making continued calls, sending letters, emails etc to public officials including the POS Councillors regarding the issue. Getting the media to devote more attention to sharing information about gender and equality issues. The discussion reached its most poignant when a little girl, no older than nine years old, came forward to express her view on girls, self-esteem and standing up for their rights. If nothing else was accomplished on Friday, I am satisfied that that little girl is building a future where she knows she has rights and is brave enough to stand up for them, even if she feels scared. The organisers of the protest and other partners are making plans to ensure that action on this issue is sustained and expanded. We are well aware that even if the Mayor does demit office, the problem is one that will require long term intervention. At the protest I was able to identify people from various women’s groups, artists, people working in Ministries, environmentalists and the media. This is a great moment to be able mobilise and created linkages and networks to advance the work. We know that change doesn’t happen in a day, but we also know that we need to have a critical mass of persons across civil society – not just women’s organisations – that buy-in to the cause and are willing to not only lend their support but their labor and resources to help ‘action’ these next steps. What will be critical now is devising a series of actions at different levels and scales that will keep the issue on the table. Strategies will be needed to periodically revitalize the message while at the same time having consistent lower profile actions that work at the institutional level – (development of internal policies, monitoring of actions and compliance, education and training). Already, one of the superintendents who provided crowd control at the protest has agreed to have gender-sensitivity training for his officers once the proposed toolkit is developed. Yay! Already another great outcome. 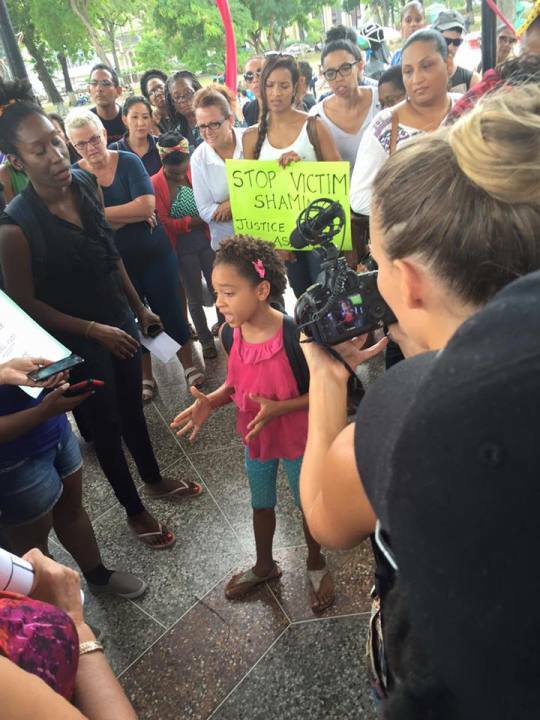 Finally, I applaud Atillah Springer, Stephanie Leitch and Angelique Nixon for their leadership on this issue. Now it’s time for the rest of us to do our part.